Three of the four models were made in Tinkercad. The spheres and half-spheres were made while the students learned how to use the Align and Hole tools. The figures with arms in the air were designed with extensive use of the Ruler tool and hand-calculated distances. The rockets were a minor miracle, as the students had decided to make one rocket that fits inside another and had to make a good guess for the amount of clearance/tolerance. They only had one try to make that guess, but they hit it square on the nose! The small rocket clicks into the large rocket beautifully. Once the picture is drawn there isn't much to do; the only thing you have to start with is the angle alpha and the original side length of 1. 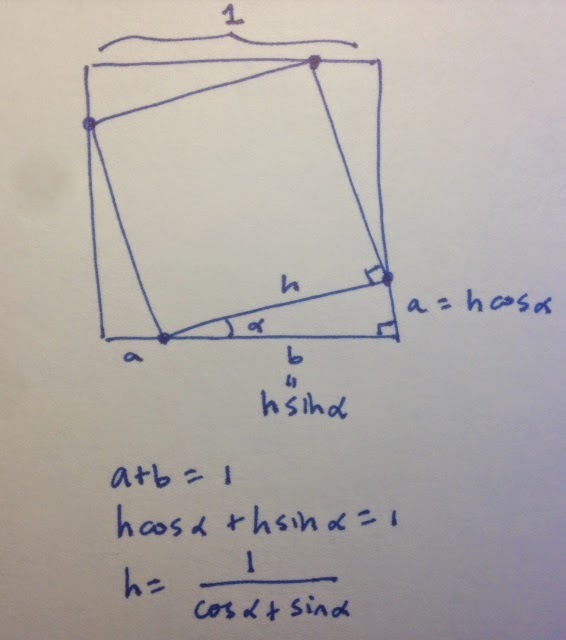 With a little trigonometry you can figure out the lengths of the legs a and b in the diagram, but what you really want it is the new side length h. The key insight is to realize that a + b = 1 so that you can solve for h, which becomes the scaling factor. The USAMO students are some of the smartest, quickest math students in the nation. The top scorers will go on to represent our country in the International Mathematical Olympiad. They will go to college pretty much wherever they want to. They've worked amazingly hard to get to the level they are at, including taking extra courses and training workshops from organizations like the Art of Problem Solving. When they see a problem to solve they dive in fearlessly. They are curious, relentless, driven. Obsessive, even. In other words, they already think like mathematicians. Most importantly, like all mathematicians, they are experts in something that most people are terrible at, and it's not what you think it is; it's not calculating, or reasoning, or number sense, although they probably have all that as well. It's being able to be WRONG. To fail. To be stuck, confused, and lost. And then to get back up again and find another way around the problem. 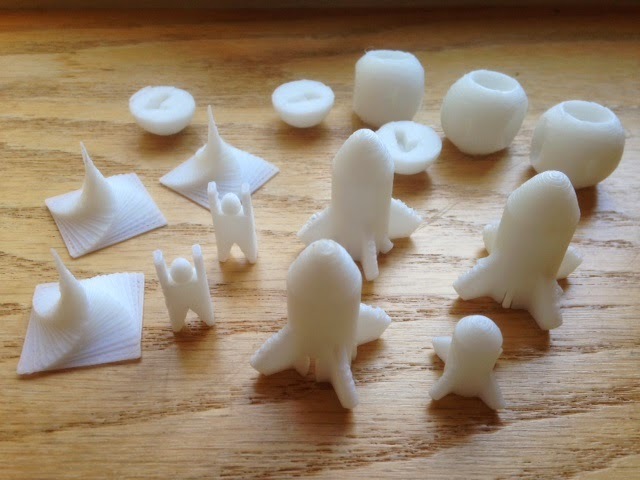 One reason I was particularly excited to run a 3D-printing workshop with the USAMO champions was because I knew that most of them would have tons of mathematical experience, but no experience at all with 3D printing or design. These students are used to being the best. Not the best in their class or the best in their school, or even the best in their state. The best in the country. And competing with the best in the world. They are used to success. But in a 3D-printing workshop the playing field is level again, and the USAMO students struggled with basic alignment issues, design problems, and coding syntax just like all my other 3D students do. UPDATE: Katherine Merow wrote a nice article for the MAA News about this called USAMO Winners Celebrated - and Challenged.